Su Lin and Andy have everything they want on their farm–solitude, livestock to occupy them, and one another. Most importantly, Su Lin is worlds away from her old life. However, Su Lin and Andy are not as free from Su Lin’s past endeavors as they would like to believe. She is a genius in her own right, and that, in and of itself, may just be the downfall of her family and the entire team. As digital currencies begin to lurk behind the world’s financial curtain, Su Lin rises as one of the most desired faces on the planet as she possesses the unbreakable code that can help turn the world’s currency system upside down. The Enigma Source, by Charles V. Breakfield and Roxanne E. Burkey, features the dynamic team from Breakfield and Burkey’s long list of Enigma books and is every bit as engaging and brimming with technological advancements as each of the pair’s previous installments in the series. The Enigma Source takes readers on a journey eighty years into the past as events in Poland are related via a set of books discovered by Jacob. Throughout the book, the authors have juxtaposed Jacob’s reading of said books with the events endured by Su Lin, Andy, and the rest of the team as they fight to stop Su Lin’s nemesis, Guano. I am never disappointed in the strength and depth of the relationships between Breakfield and Burkey’s characters. Su Lin and Andy are the focus of The Enigma Source. Their love is intense, endures each and every test thrown their way, and is to be envied. They are among the most vivid of the authors’ couples–second only to Juan and Julie. I didn’t want to be, but I was struck by Mathias’s sense of loss over Dutch. Breakfield and Burkey have a way of making the reader see the humanity in their antagonists. A sense of pity and sorrow overwhelmed me as I read of Mathias’s grief and his tragic revelation with regards to his own staggering lack of true friendships. ICABOD, the ever-present supercomputer, remains one of the most fascinating aspects of the Enigma series. ICABOD is a unique blend of technology and humor. Throughout the book, the team of experts turns to ICABOD for intelligence and briefings and are able to obtain the needed information almost instantly–always amazing. In addition, there exists a friendly banter between the team members and the supercomputer that lends a welcome level of levity to rather serious and many times, dark situations. ICABOD is only the beginning of the advancements peppering Breakfield and Burkey’s work. I was fascinated by the capsule used to track Su Lin’s movements. As she prepares to fly to China, her ingestion of the tiny encapsulated tracker mesmerized me. As with each of the other Enigma books, the authors’ storylines are rich with technology that will wow readers from the first page. 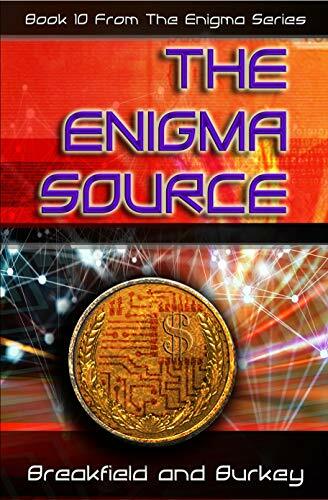 I am giving The Enigma Source, by Breakfield and Burkey, an enthusiastic 5 out of 5 stars. Rich characters and spellbinding storylines permeate The Enigma Source. Readers looking to take a leap into the depths of the digital age will find everything they want within the covers of Breakfield and Burkey’s The Enigma Source.